As a freelance writer, my work days vary. Yesterday I worked from dawn to dusk, so I have the day off today. This means I’m hanging out on the couch, binge watching episodes of Chopped, chugging water, and stuffing my face. Days like this are perfect because I have time to cook! And lucky for all of you, I got a little creative with a Spaghetti Squash. Once the oven is preheated, place your two pieces of squash on a baking sheet and drizzle with a little Olive Oil. Cook for about 20 minutes. Chop up your red onion and cut your grape tomatoes into halves and then those halves into halves. So you should have 4 pieces of one tomato when you’re done. Add a little Olive Oil to a pan and add your spinach, onion, and tomatoes. Cook on medium heat, constantly mixing until spinach appears cooked. Once the Spaghetti Squash is done, use a fork and scrape it against the squash to get the spaghetti part. Add your mixture into the squash, and add a little brown sugar or Nutmeg. (The first half I used Nutmeg, and while it is flavorful, I feel the brown sugar mixes better with the squash). 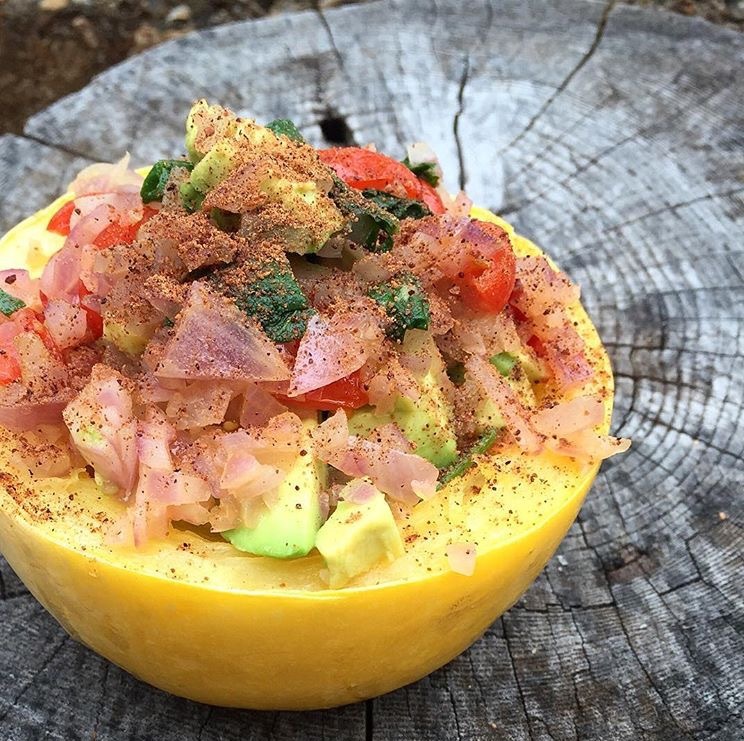 Spaghetti Squash is full of vitamins A and C, which is going to help protect your skin against free radical damage, and the vitamin C will help with collagen production. Tomatoes also contain both vitamins A and C. Tomatoes are also known for helping the skin retain moisture, which is great for the cold weather we’ll have coming in the next couple of month; prepare now! “What Are the Benefits of Spaghetti Squash?” Woman. N.p., n.d. Web. 27 Oct. 2015. “32 Amazing Benefits And Uses Of Tomatoes For Skin, Hair And Health.” STYLECRAZE. Arshi Ahmed, n.d. Web. 27 Oct. 2015.